BookYap’s Review: Big data is one of the key influential factors that is growing fast in importance. To put it in a simple analogy, big data to our digital age is like gasoline to the automobile which made the horse carriage obsolete. And since big data can be reused in many different ways, the full leverage of its uses can be the big step up for us like going from gasoline vehicles to full electric. I get excited just reading the first chapter of this book, and it’s normal because I’m a futurist tech nerd. 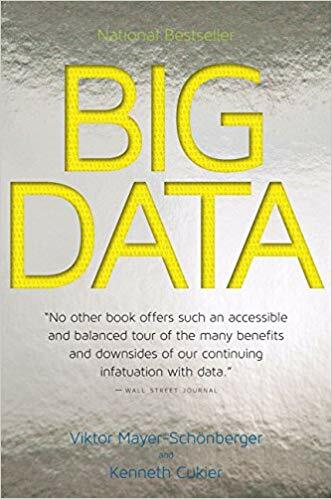 However, no matter which type of person you are, this book provided many ways to look at big data to help you at least aware of what most likely pan out in the next decade regarding how organizations utilize big data. In this chapter, the authors gave a friendly introduction to big data along with a few examples of its positive uses. The chapter titled “Now” as of 4 years ago (since this book published in 2014) we should know that 4 years in the digital world is like 12 years in our normal world. Here is a small example of big data in action as of October 2018: A few weeks ago I took my dad who is almost 70 years old to a clinic for his physical checkup. As I arrived at the clinic, within 30 minutes an advertising text message about health insurances sending to my phone. Moreover, it is sending me related messages every few days now. Receiving the first text message might seem okay, but other advertising messages coming in after that is just annoying. I think in the next decade, startups who focus on building software that block spammy activities from the uses of big data will attract consumers’ interests. Whatever the case, big data is an inevitable thing moving forward; so as the consumers, I think we need to educate ourselves about it.